Nothing beats the getting your customers directly involved with your company. No matter if you supply products or services, we all strive to get our offering directly in front of our clients, and nothing is more powerful than doing this in an interactive way. Large format interactive flat screens are the perfect way to do this. Display your website, app or software in full 4K stunning resolution with multitouch features and larger than life reality. Interactive Flat screens are the perfect display for your exhibition stand or booth. 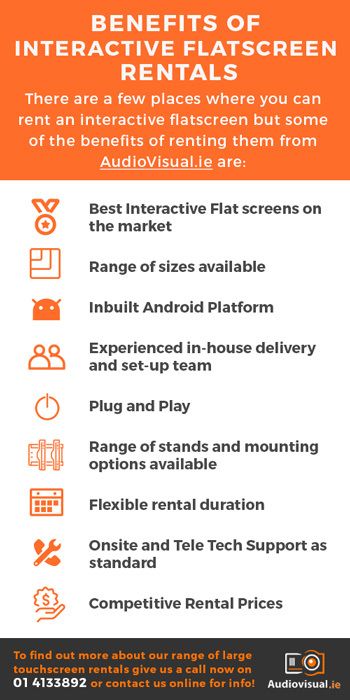 Look at some of the benefits of using Audiovisual.ie for your Interactive display rental. The most popular rental sizes are 42”, 55”, & 65”. Up until now, 19” & 22” kiosks style units were the only touch screen options available, nowadays interactive large format displays have completely changed the way we can communicate. We can display eye-catching 4K content with interactive touch capability. The options are endless. Content varies from user to user. The most popular content tends to be web based, primarily a website or an app. The big danger here is inadequate internet connectivity. Make sure you have an adequate internet connection available wherever you are using the display. If you are exhibiting at a large convention centre or trade show, be wary of using a free public WiFi. As the show gets busier and more and more people hop on the free WiFi it will struggle and you’ll be left waiting as your digital content buffers to a standstill. By the way, your mobile phone hot spot will probably be much the same. It is worth paying for a dedicated wired internet connection to be supplied to your booth. The best content is that which has been specifically designed by a graphic designer for an event or specific set of events. graphic designers bring the power of a 4k display and interactive touch together by designing content that can bring your customer on a journey. This content type is often in PDF or flash format. Well worth the spend! And of course the content can be re-used at future events. Where Can I Hire An Interactive Flatscreen Display? If you decide you want to hire an interactive flatscreen you can contact us on +353 1 4133892. We provide a professional range of large format interactive flatscreens on floor stands. We deliver, set-up and take the equipment away when it suits you. Why not stand out from the crowd and make your next show interactive? Call us on the number above or contact us online for more info!